Those making a circuit in the Grand/Zion/Bryce Canyons-area who take the time to go to Arches usually drive north on U.S. 89 through the small Mormon towns of Panguitch, Circleville and so forth until cutting I-70 and turning east, eventually turning south on U.S. 191 which passes the entrance to Arches and enters Moab a few miles beyond. That route is much faster. In fact, when our daughter, Sina, and family returned home from Arches, she back-tracked onto I-70 and got home to Las Vegas in about six hours. 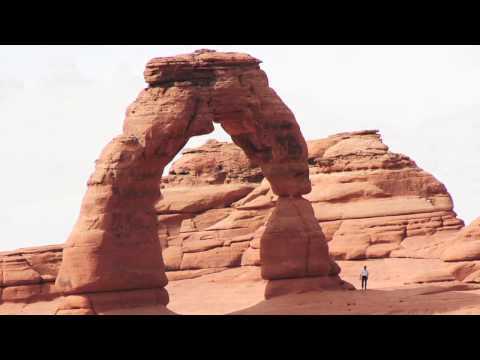 Beyond its natural wonder, one of the things that makes Arches so appealing is it’s accessibility: You can practically drive up to most of the sights…or for the hardier there’s lots of hiking, and even rock climbing. For example, our gang took the half-mile hike to the lookout point for Delicate Arch, which has become an icon not only for Arches but the entire state of Utah. I might be wrong, but I also seem to recall back in the day you could mountain bike in the park; that’s no longer true (except on paved roads), but off-road biking is still a major draw in other non-park areas around Moab. The Biblically-named Moab, yet another town in this region with historic Mormon ties, became the “uranium capital of the world” when a rich deposit was discovered nearby in the 1950s. Today the town of about 5,000 people is a mostly a popular tourist attraction for those visiting Arches, Canyonlands National Park, or enjoying the mountain biking and off-roading. For example, we took the nine-mile detour off Highway 12 and were surprised at the number of RVs and people camping in the small Kodachrome Basin State Park (pictured above). Kodachrome™, for those not familiar with the term, was the branded trade name of a highly-regarded color reversal film (whose processed pictures were often called “slides” or “transparencies”) made by Eastman Kodak between 1935-2009. By the way, there is a $6 entrance fee for each of the Utah state parks. The 10,188-foot Point Powell of the Table Cliffs Plateau is named after Major John Wesley Powell who in 1869 became the first European-American to ride the Colorado River through the Grand Canyon. Powell, who would later serve as the second director of the U.S. Geological Survey, returned to the area in the early 1870s to fill in the “unknown country” in “the last blank spot” on the map of the continental United States at the time. Highway 12 follows the route of the second Powell expedition from Henrieville to Head of the Rocks, east of Escalante. Anxious to move on to Arches, I confess that because the normal hike would take several hours we didn’t enter Escalante Petrified Forest State Park…beyond the “petrified cove” (pictured above), a little display area near the park entrance; but for some reason, I’ve always been fascinated with the notion that trees can be turned into petrified wood over geologic time. There’s so much more scenic wonder along Highway 12, such as kajillions of beautiful wildflowers, at least when we went in early June. Then there’s the occasional thing that just made us wonder, such as a lone rider on a heavily-laden bicycle pedaling up a steep grade: Was he lonely, or having his own brand of special experience? In any case, his experience was definitely different from the many motorcycle riders on robust touring bikes and “hogs” who were also trekking along Highway 12 — some of them pulling little trailers and warmly dressed in leathers, despite the desert heat. The expanse of red-rock beauty between Escalante and Boulder simply defies description. In a word, it’s amazing. Part of the stretch, known as the “million dollar road,” was built by the Depression-fighting Civilian Conservation Corps in the 1930s, but it wasn’t paved until 1971 — finally providing year-round access to that area. “The Hogback” is another fascinating feature I wanted to photograph, but at the time I didn’t dare take my eyes off the road: After passing Calf Creek Recreation Area, Highway 12 proceeds along a very narrow ridge with almost no shoulders and steep drop-offs — a thousand feet or more? — on both sides. “Scary,” my wife said. Indeed, the ridge is definitely not a spot for faint-hearted drivers, and I also wouldn’t want to cross The Hogback at night or in any kind of stormy conditions…but the views for the passengers are incredible. Then, surprisingly, the drive from Boulder to the end of Highway 12 at the Torrey junction climbs through quaking aspen and pine forests to almost the 10,000-foot pass over Boulder Mountain. The view back over the country we traversed (pictured above) was spectacular — with Navajo Mountain peaking through the haze over 50 miles away. However, the strong wind was cold, even in June, and the elevation kept us sea-level people (the mean elevation of Laie is two feet) gasping every once in a while. A sign at the turn-off indicated this section of the highway wasn’t paved until 1985, and it took seven years to complete the project. Prior to that people had to drive an extra 200 miles through Panguitch to get to Torrey and beyond. Highway 24 beyond Torrey follows the Fremont River through part of Capital Reef National Park — yet another beautiful place in this exceptional canyonlands country. The river provides the means for sustaining the beautiful little farms and orchards along the way, which undoubtedly prompted the name of the little Mormon town of Fruita, which also features a historical one-room schoolhouse, maybe 10′ X 10′ in size. The name, Fruita, reminds me that there’s another little town in this area called Loa — a Hawaiian word brought back by the Mormon missionaries who served in the Sandwich Islands to help them remember the tropical islands that are in such contrast to the desert home they settled.